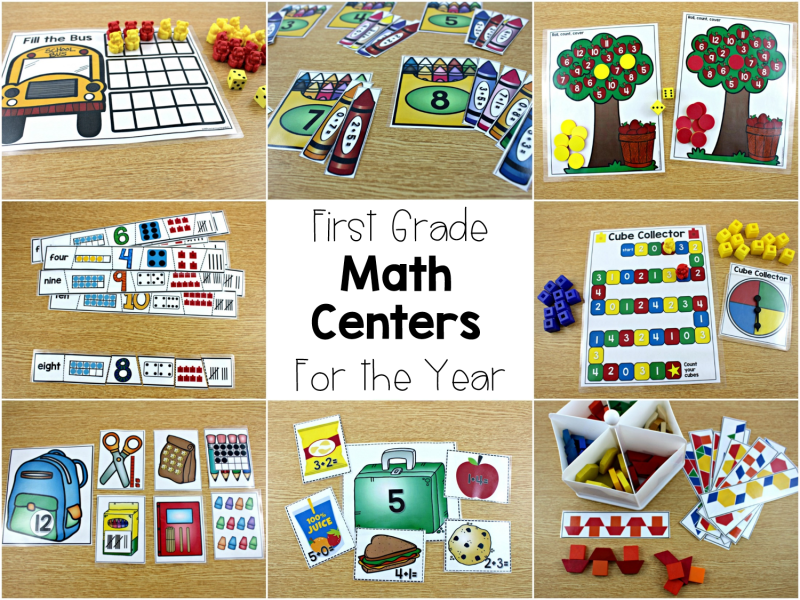 I don’t know about you, but my FAVORITE time of the day has always been math centers! I just love the ability to let students take charge of their place, pace, and product! This post is all about providing meaningful math centers for first grade! Because we spend 20+ days introducing our students to the guided math structure, the activities I want to provide during August and September are going to review skills that my beginning first graders were able to do in kindergarten. I want to lower my students’ anxiety levels while providing activities that excite and engage them to practice and apply important concepts that we will build upon in first grade. More on launching guided math HERE. Take a peek at the beginning first grade skill levels that students can work on during their first month of math centers! Roll to fill the bus. Students take turns with a partner to fill the bus. (3 tens frames) The student that fills the bus first wins. Roll two dice and add the sum. Cover the apple with that matching sum. Try to cover your apples before your partner does. 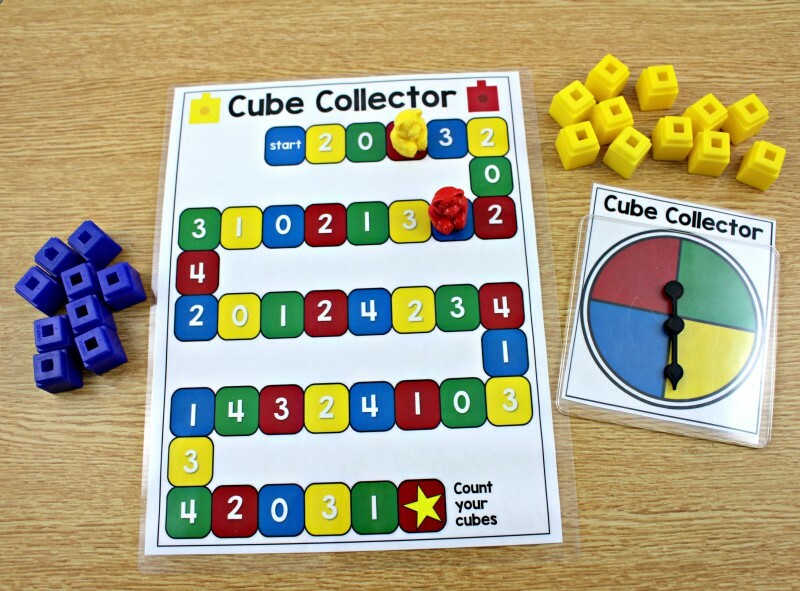 Cube collector is all about collecting cubes as you move on the game board. Students will count and compare totals when they reach the end of the game board. A big favorite, students recreate different pattern block cards and then extend the pattern beyond. 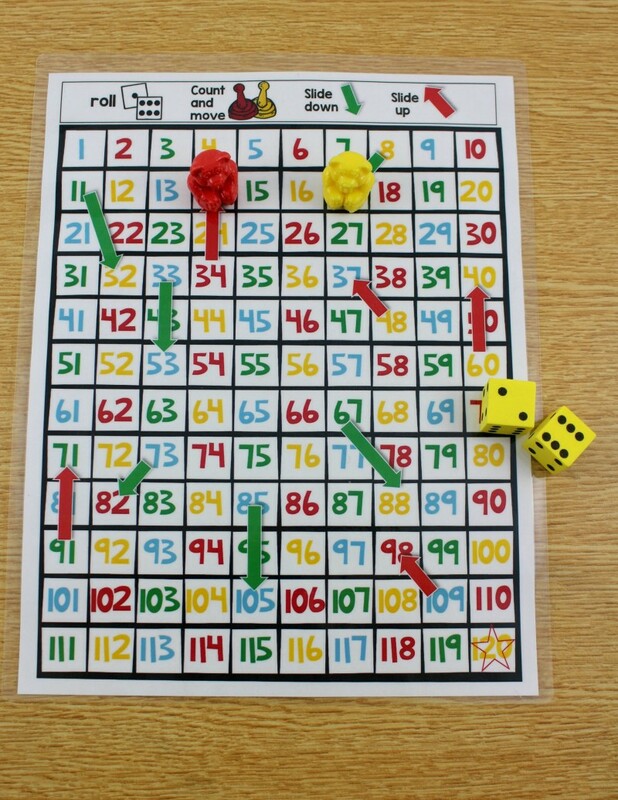 Just like chutes and ladders, this fun game helps students get comfortable with the 120 chart. Students use manipulatives to solve simple addition to 8. They match the crayons to the box with the sum. Pack a lunch! 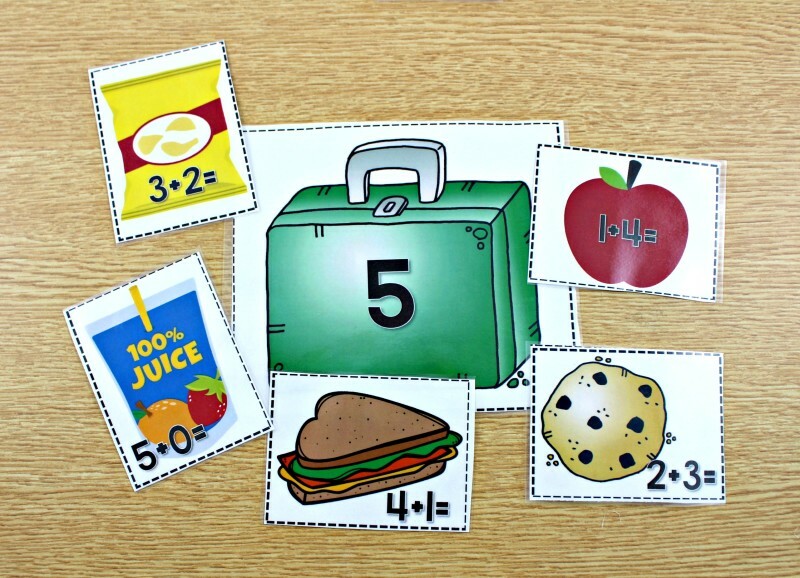 Students use manipulatives to find the sum of items and pack them into the correct lunch box. Sums up to 10. If you follow my blog, you know how I love to give my students varied rotations during guided math. Rather than every student being at a math center, I like to use the acronym STACK. More on that HERE. If you want students to have a recording sheet for their center work, I have you covered! 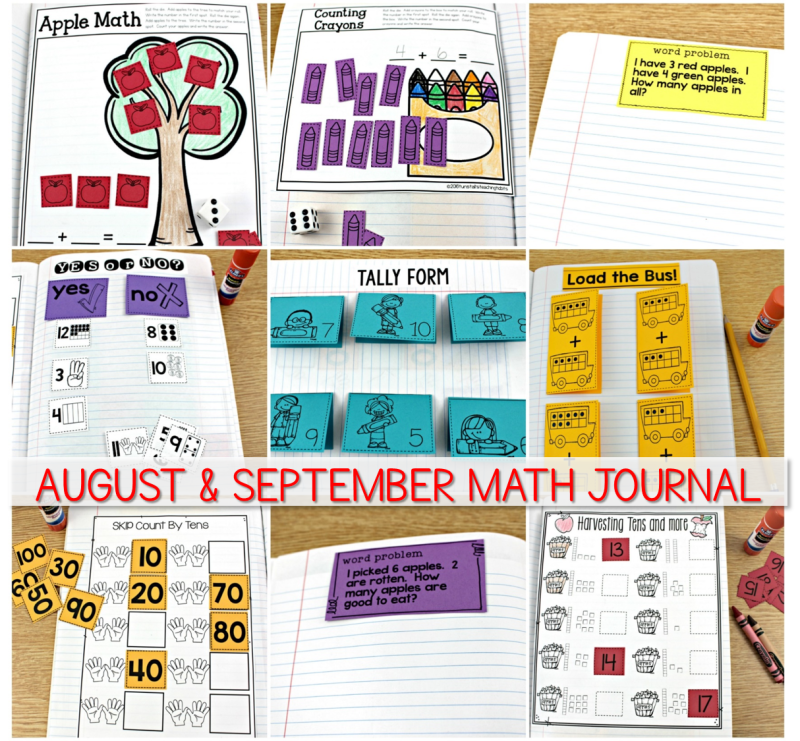 I created a math journal activity and a math seat work type printable to use in your rotations too! 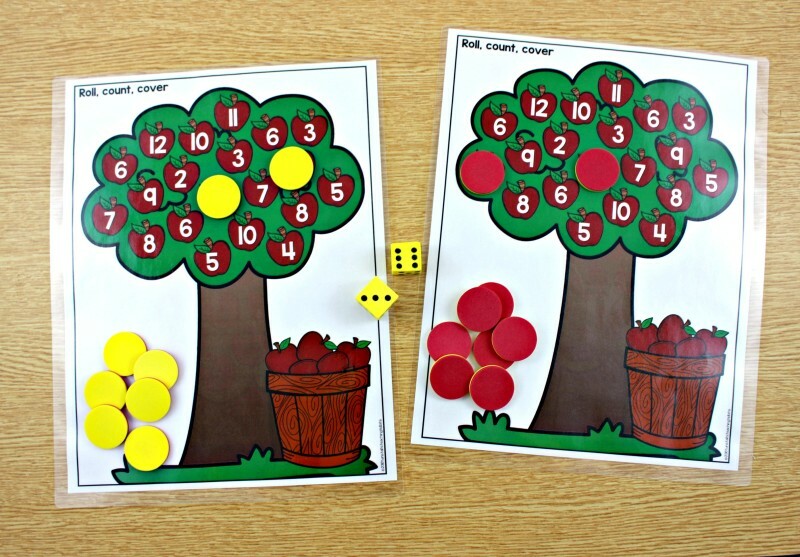 In the picture below, students will enjoy the hands on game of adding two dice together. Then during their next rotation, they work in a math journal. They will create an addition math story by rolling dice and recording the number sentence. Next, in an independent practice rotation, there is a printable ready for students to add numbers using an apple number line! 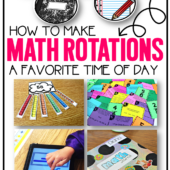 Here’s another example of how to use these activities in your math rotations below. Students do a math journal activity where they add two numbers and write the number sentence and answer inside the flap. Then in a math center they enjoy the hands-on game of adding bears to fill up 3 tens frames. 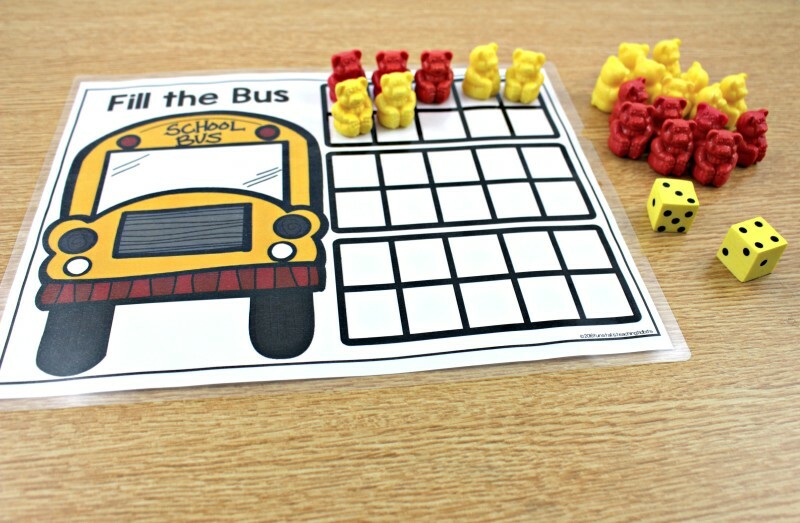 Finally in a seat work rotation, students will complete the ten frame addition bus printable. What’s great is that you can use the printables, centers, and journals all separately any way you like or tie them together in rotations. The activities are all able to stand on their own, but also work together to reinforce skills. 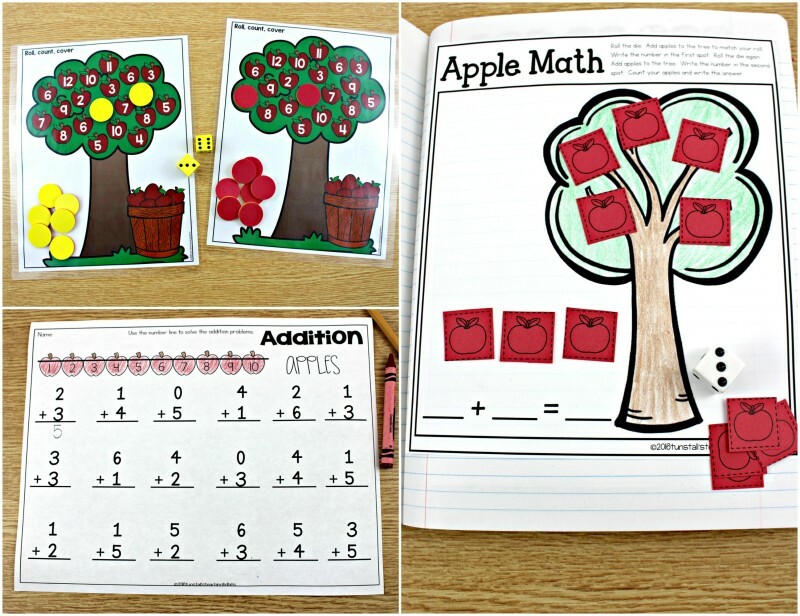 There are 10 math centers, 10 printables, and 10 journal activities for you to use any way you need! 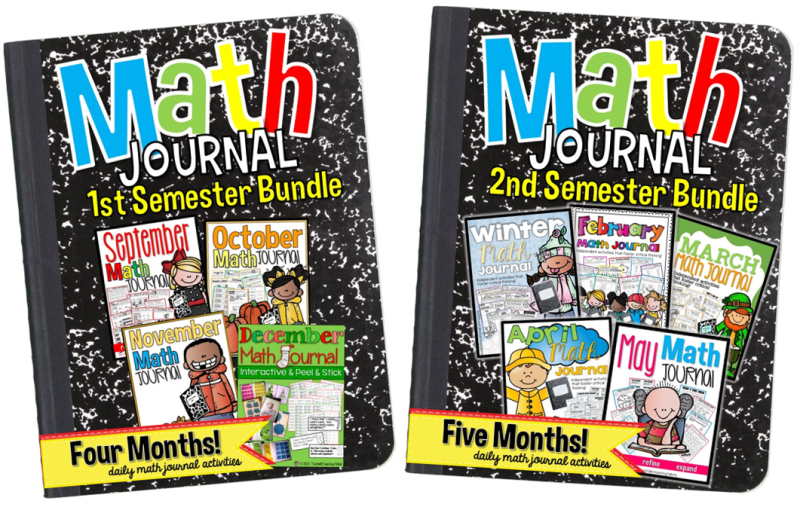 If you are thinking about starting a math journal this coming year, I hope you do it! I can’t tell you how much my students LOVE their math journals. I was hesitant for many reasons, but it was one of the best things I have ever introduced to my students! The journal activities in this August/September unit are different than my other September Journal. The reason, is that I wanted to have more variety! 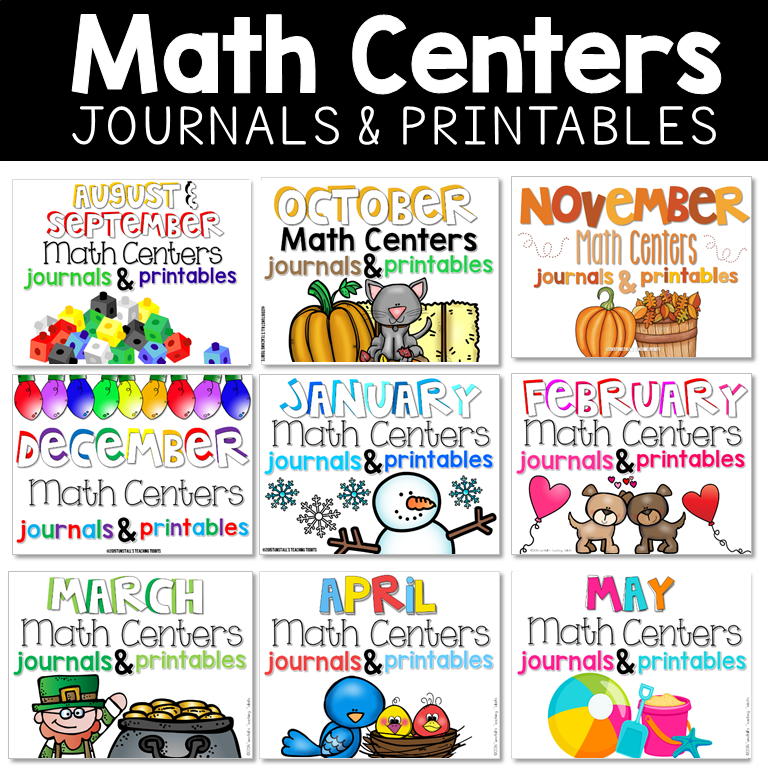 If you like the idea of having 10 math centers, 10 journal activities, and 10 printables for each month, you can get ALL of the months in a discounted bundle by clicking HERE or the picture below! 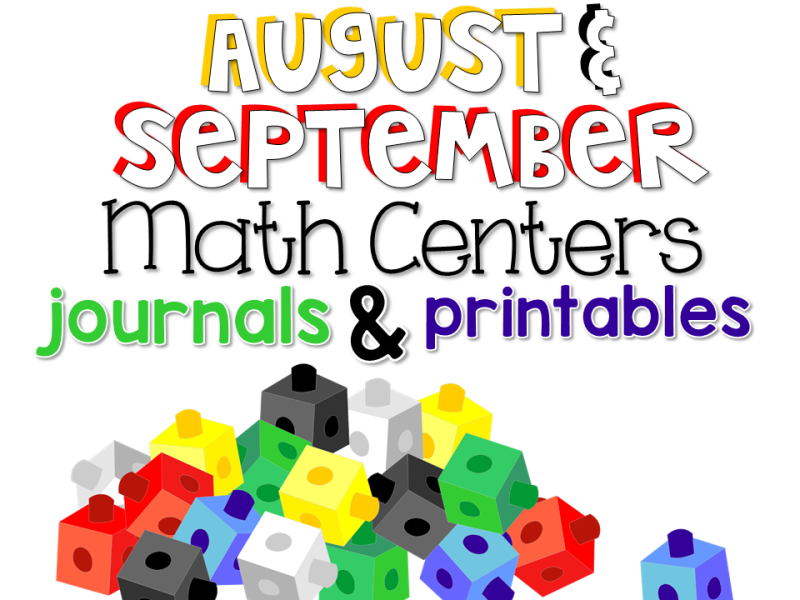 If you are looking for even more math centers, you can also get this bundle of math centers for the year. These activities below do not overlap with the centers above! 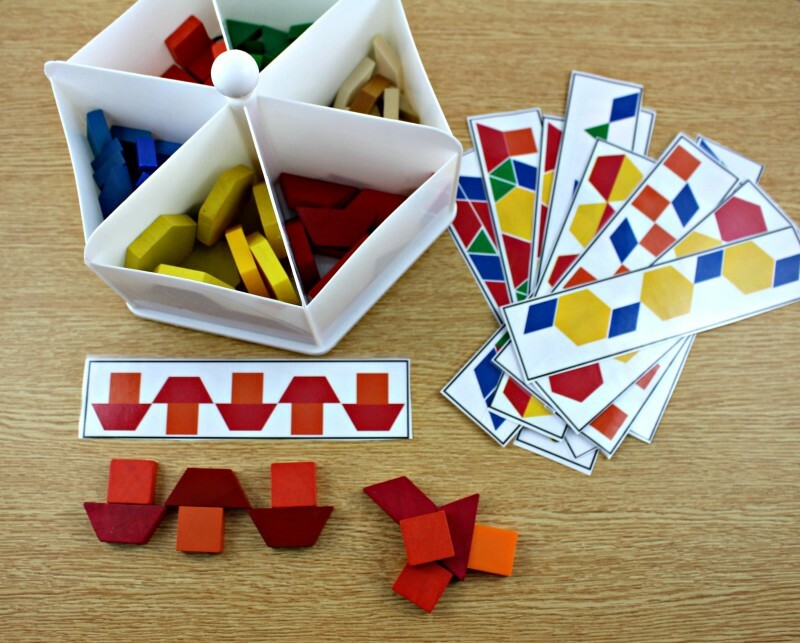 With these two bundles together, you will be set for the year of math centers and then some! 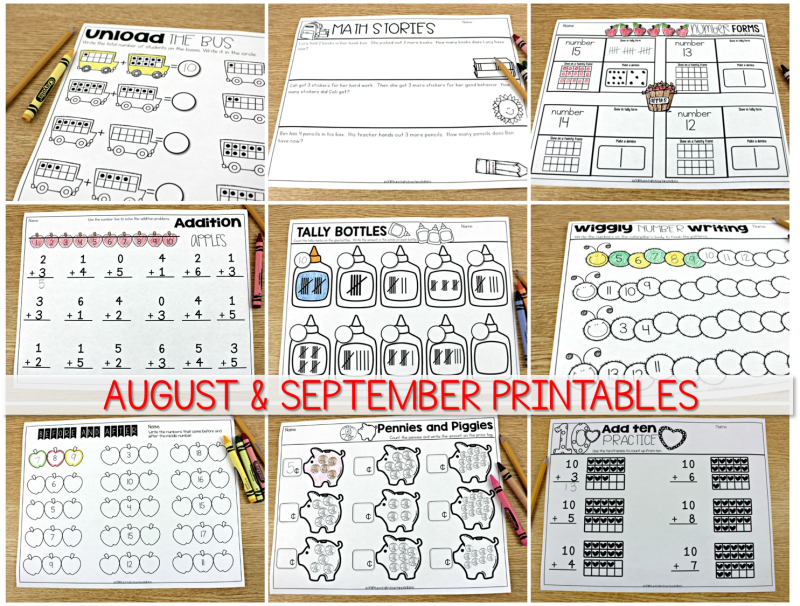 The bundle below has 8-10 centers per month with recording sheets. None of the math centers that I offer in my store overlap. None of the different journal packs in my store overlap. You are safe to get what you think looks right for your class without worrying that the bundles overlap! Nothing is duplicated. I get that question a lot and wanted to be sure to mention it. Thankfully there is a nice long Summer for prep! If you are wanting even more journal activities to choose from, you can find all of the monthly sets (and bundles) in my store HERE. You’re amazing and this is amazing! Can’t wait to see your guided math for kinder!!!! This summer possibly? 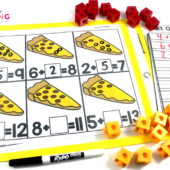 Guided math for kinder is posted! It is a growing bundle. Unit 1 is up! I love the idea of the 10 and 10 and 10 all correlating!! I know you have mentioned working on math for kinder. Do you plan on creating the 10 and 10 and 10 to accompany the guided math? THANK YOU SO MUCH for all you do! You are so amazing! I follow your blog but teach low kinders so I have never purchased your math products. I just LOVE your organization and layout of your math so I can’t wait to see what you create for kinder!!! Yes I will be making the same for three grade levels. THANK YOU SO MUCH!! 🙂 I can’t wait! I just love the games! Are these aligned to Common Core? Do they have the standards addresses listed? These are aligned. I didn’t list the standards. Love love love your creations! ? Where did you get the hexagon-shaped caddy that organizes your shape manipulatives? Very cool! I want one! Thank you Melanie! It was in the target dollar spot area! 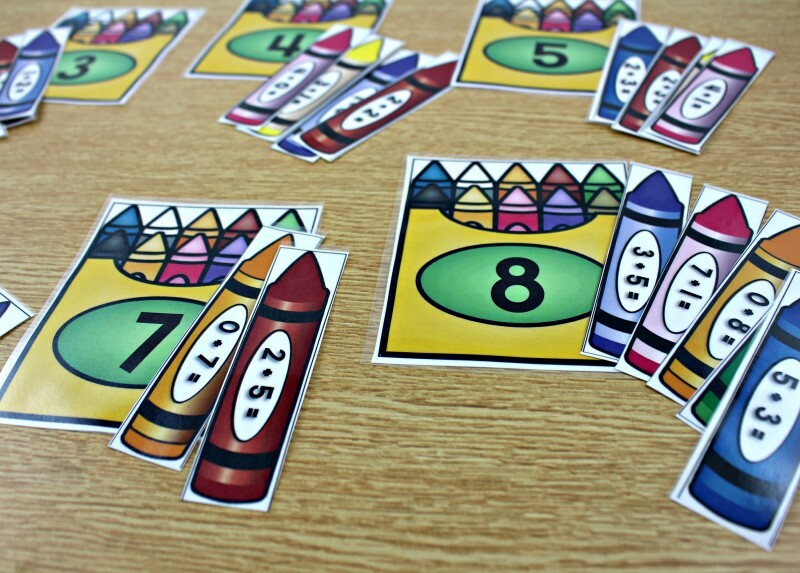 Do you have a math bundle for kinder? How does your school handle copies? I love how you do math journals but am afraid I’d run out of copies. Ideas? Yes all of the bundles are separate and none of the activities overlap so you don’t have to worry that you are paying for something twice. They all work together within the math block if you choose to design it the way that I have shared works for me. There’s no end to the way you can set it up, so I wanted to keep everything separate. These look amazing! Can’t wait to purchase and use some of them. My question is about how you mentioned your products do not overlap. So, if I purchase the centers/journals/printables option then I am not getting the centers in the First Grade Math centers for the year? And the journals in this option are not the same as the semester journal bundles? I just want to get as much as possible for my money and don’t mind paying for the bundle, just wanted to get some clarification. Hello! I didn’t mean to confuse you! The center bundle that contains journals, printables and centers has 10 of each of those activities for your rotations each month. If you just buy journals from me they are different than the journals in the bundles so you don’t have to worry that you are duplicating product. I use all of it. I like to have options and plenty of activities at my fingertips. 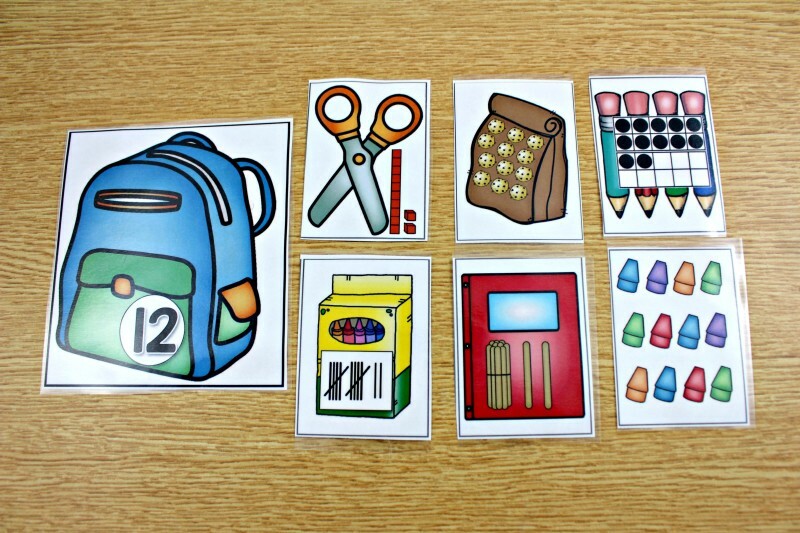 What do you use for your mini lessons & guided math small group lessons to teach the content? I created guided math lessons for each day. These are warm-up, whole group and small group lessons with all of the activities for each day! 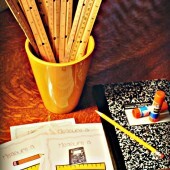 They are called guided math and you can find them on the right hand side of my blog for each grade level. As a fresh second year teacher in first grade, your blog, insight, and tidbits 😉 have been so gracious and helpful to my heart. I have been so encouraged by your transparency in what guided math can look like! I assure that I have found much encouragement and relief in the step by step model you offer, as well as the blog posts that explicitly break down the components. I have so enjoyed and been relieved learning from you! Thank you thank you thank you. I do have a question about math centers/tubs. With 5-6 students in each group, how many sets of the activity do you have in each tub? If there is only one set of the activity, I can imagine all 5 students finishing the activity fairly quickly. Are there multiple sets you make so that students can work in pairs or independently? I understand that ultimately, this is yet another aspect dependent upon the needs of my students and what I find works best for us. But I also need a place to start. I have a fear that with one set of an activity, the students would finish early in that particular rotation. Do you have them go through it again when extra time is left over? Thank you again for your model, transparency, and commitment to sharing your practice. It’s a joy to read and learn from you! Hello! I usually make 2 sets of each activity and put my students in partners. If I have 5 students I will either make a group of 3 or make 3 sets. I also have fast finisher tubs (4 expert tubs as I call them) When students finish (this doesn’t happen too often as I have my rotations at only 10 minutes) they can play an expert tub game. 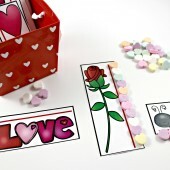 These are well loved or easy and fun activities that students can do for extra time. My math sticks packet has 10 perfect games for this. I hope you enjoy it this year!! Are all your resources aligned to the TEKS/ Instructional Focus Documents? Where can I find 2nd grade? Love it! HOW TO DOWNLOAD ALL THE MATH CENTERS? IS THIS FOR FREE? Hi, I just got the guided math units for first grade. Although it’s a little late in the year for some, I am going to start the geometry and fractions unit this week. Can’t wait to see how my little ones progress through it. A fellow teacher in my district recommended them and she’s thrilled!